I thought I’d find a link to The Onion for this story, but I suppose The Guardian is almost the same. Rock guitarist Brian May is named today as chancellor of Liverpool John Moores University. The lead guitarist and songwriter for Queen, who recently completed his much-delayed PhD in astrophysics, succeeds Cherie Booth QC as ceremonial head of the institution. Earlier this year, May was made an honorary fellow of the university for his contribution to the arts and encouraging the public understanding of science through his book Bang! the Complete History of the Universe, co-authored with Chris Lintott and Sir Patrick Moore. Previous works included We Will Rock You, Fat Bottomed Girls, Tie Your Mother Down, I Want It All and Who Wants To Live Forever. But his website mixes music and astrophysics; May’s blog today deals with the hyperbolic orbits of interstellar particles, for instance. Just when you thought physics, science, and space couldn’t get any closer to science fiction. All this from a great thread on the suspicious university in Liverpool, who seem to specialize in myth making. This entry was posted in Celebs, Cluesforum/September Clues, Science hoaxes on March 31, 2014 by ab. Double talk and doublespeak is classic disinformation, and also classic psyOp talk. William Jefferson Clinton was an expert at it, being Jesuit trained in the trivium. The story of the missing jogger in the Toronto area is most suspicious, and certainly looks like a psyOp hoax. It appears we’ll have to wait for its purpose. Some oddities persist. Why are they still using the same strange degraded photograph? In all this time, isn’t there a more favorable picture of the missing person provided by the family? Here is the article a follow up to the story. Is he found or not? Is the body his or not? Is there foul play or not? The coroner releases autopsy results from downtown Toronto. Does he have a record of this case? Do autopsies get done this quickly? Would he release an autopsy without conclusive results? The following passage is all contradiction; classic obfuscation to hide anyone from knowing anything and thereby relieving the deceivers of any responsibility for what they say. Foul play is not suspected in the death of Whitby jogger Jeffrey Boucher.Police released the details of a post mortem conducted Monday, saying while the actual cause of death has yet to be determined, “no foul play is suspected.”Police also noted that while a positive identification of the body found Saturday on the shore of Lake Ontario hasn’t been determined, it’s believed it is Boucher. 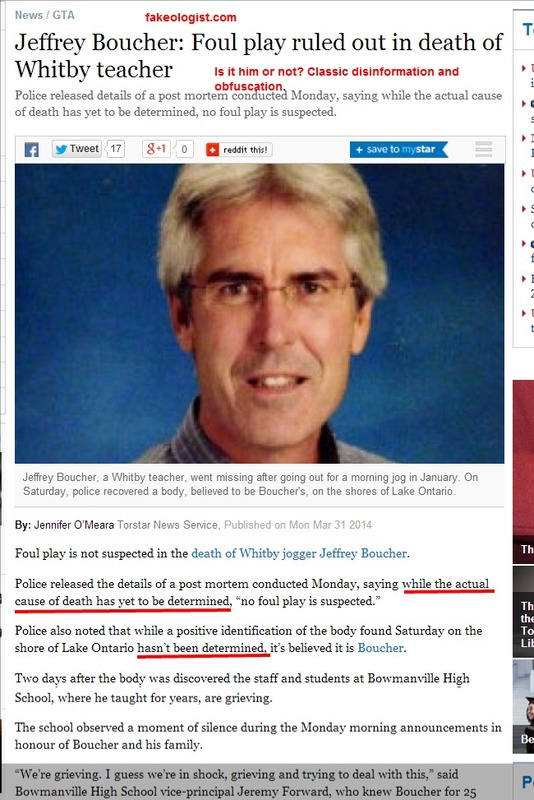 via Jeffrey Boucher: Foul play ruled out in death of Whitby teacher | Toronto Star. This entry was posted in Suspicious media events on March 31, 2014 by ab. CDI was no doubt the company that demolished all 9 buildings of the World Trade Center. Nobody does it better. This entry was posted in 9/11, Recommendations, Video on March 31, 2014 by ab. Babcock International’s shares have been under pressure since last week’s news of the £950m acquisition of helicopter company Avincis and a £1.1bn cash call to pay for it, amid concerns about the cost of the deal.But they have been boosted by news that the engineering services group, alongside US partner Fluor, has been appointed preferred bidder for a £7bn, 14 year contract to manage the decommissioning of 12 UK nuclear sites. Nuclear is about an imaginary technology that is worthy of Disney science — who knows, maybe they helped animate and propagate the myth. Huge money to build, huge money to operate, and huge money to deconstruct. It’s an endless cycle and probably one of the most successful global swindles ever. via Babcock jumps 3% after winning £7bn nuclear decommissioning deal | Business | theguardian.com…. This entry was posted in Magic numbers, Nuclear on March 31, 2014 by ab. How Television Affects Your Brain Chemistry – YouTube. This entry was posted in Recommendations, Video on March 31, 2014 by ab.